Valentine’s Day is right around the corner, and I always like to get the kids a few treats. I try and keep them away from too much candy the rest of the year, but they get a pass on holidays. I wanted something cute and Valentine-y that could hold a bit of candy and a card, so I grabbed my bottomless bag of felt and whipped up some heart-shaped, monogrammed gift bags. 1. Take two felt pieces, approximately the same size, put them against each other, fold them and cut half a heart. You should be left with two separate felt pieces that are each a symmetrical heart. 2. 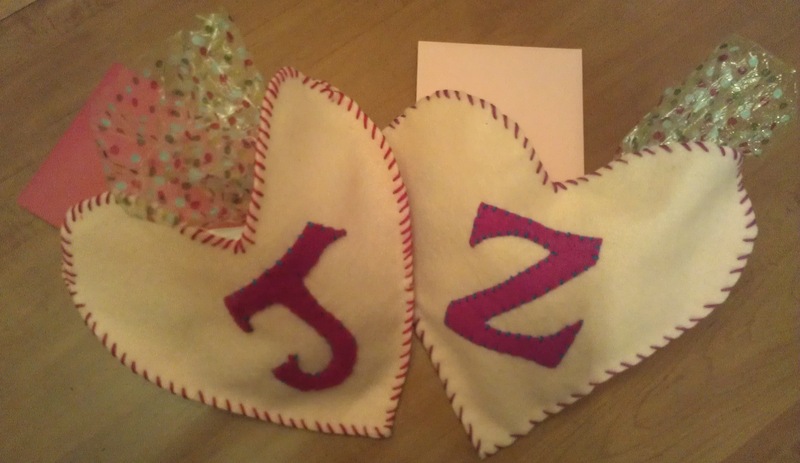 With a different, but complementary coloured, smaller piece of felt, cut out the stylized initial of your child or sweetheart. 3. 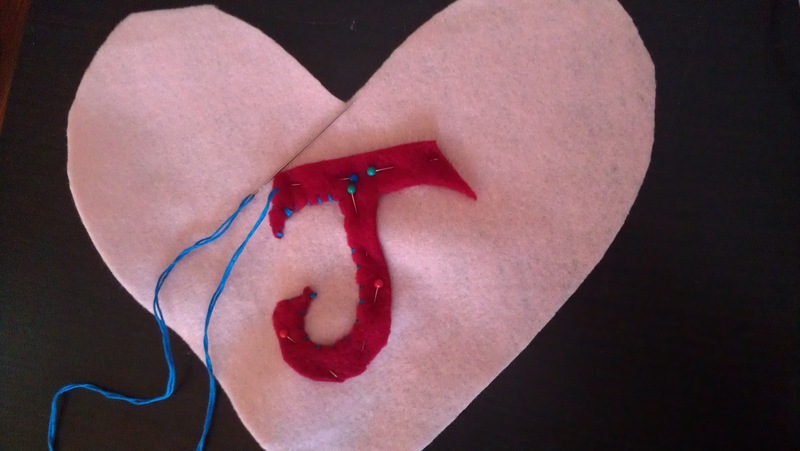 Pin the initial to the middle of one of the hearts and sew it on with embroidery thread. 4. 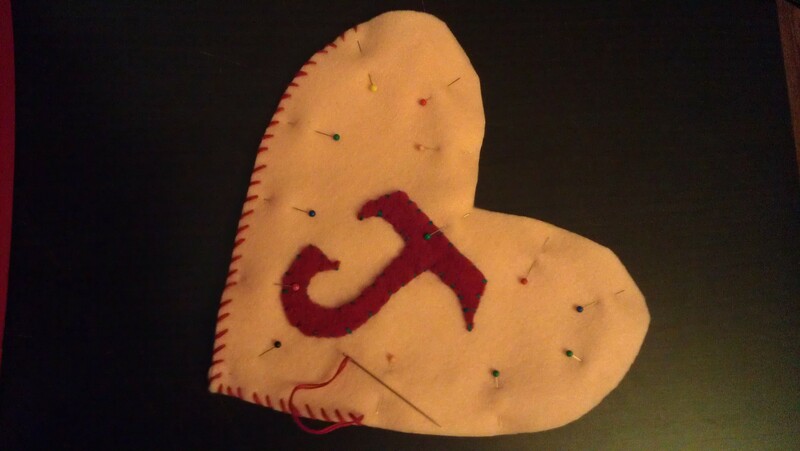 Now take the two hearts and pin them together, putting a couple of pins on each side where you want your top opening to begin/end. Sew the pieces together with embroidery thread, from beginning to end of desired opening. 5. 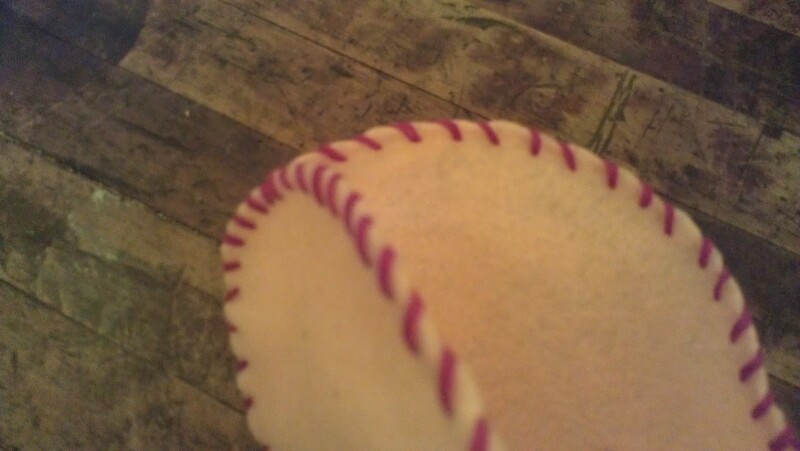 Now take the same colour thread and sew around the opening edges of your gift bag, to create a decorative edging. Make sure you don’t sew your opening shut! 6. Insert nicely packaged Valentine treats, cards, rings, what have you. Feel free to add a strap or handles if you desire. I made these for my kids, but they would make a cute, DIY bag for your grown-up babe, as well.